The Superman Fan Podcast: Episode #382 Part III: Superman Comic Book Cover Dated May 1965: Action Comics #324! I agree with you that "The Secret Life of Clark Kent" would have made a good episode of the George Reeves TV series The Adventures of Superman. I think George Reeves, with his portrayal of Clark as "meek", but, as you said, with a bit more backbone than he seems to show in the comics of this time, would have done a good job with this one. 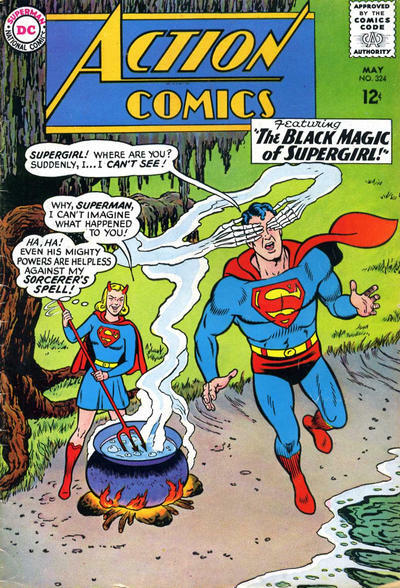 "The Black Magic of Supergirl" gives us a terrific Curt Swan/George Klein cover, and the story itself is a wonderful Silver Age story, with magic and Supergirl's fight against the temptation of evil. Even once she learned of the "cure", it was a bit of suspense to see how she'd find a "pyre" that would do the trick. Thank "Silver Age Science" that the Fire Falls were still active, even in cold, airless space.